Carbohydrates are a big part of the standard American diet and are present in most of the food groups recommended by the USDA at ChooseMyPlate.gov, which now replaces the Food Pyramid. Foods made from grains, such as rice, pasta, bread, breakfast cereals, crackers, muffins and cookies, as well as starchy vegetables, such as corn, potatoes and yams, are rich in carbohydrates. Fruits, milk, yogurt and foods and beverages containing added sugar, such as soft drinks, juices and desserts, also contain carbohydrates. Although carbohydrates are omnipresent in the American diet, several food groups contain no or almost no carbohydrates. 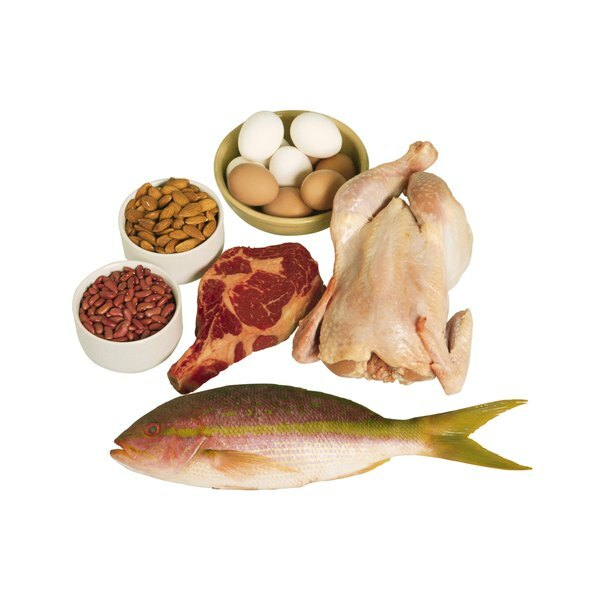 Protein-rich foods do not contain any carbohydrates, whether you choose pork, beef, chicken, turkey, fish, seafood or eggs. However, crab stick or imitation crab is an exception and provides about 15 g of carbs per 3-oz. serving, which is the equivalent of carbs found in a regular slice of bread. Foods that are breaded, marinated or served in a sauce containing sugar can also contain a significant amount of carbohydrates. For example, chicken nuggets, chicken wings, breaded fish and tempura fish contain far more carbohydrates than the plain versions. Some sausages or processed meats sometimes contain flour or sugar, which can increase their carbohydrate content. Read food labels to make sure. All the calories provided by fats and oils come exclusively from fat, and both carbohydrates and protein are absent in this food group. Vegetable oils, such as olive oil, canola oil and peanut oil, as well as coconut oil, palm kernel oil, butter, cream and margarines belong to the fats and oils food groups and are free of carbohydrates. If mixed with carbohydrate-containing ingredients, such as in a salad dressing, marinade or sauce, they can provide a significant amount of carbohydrates to your diet. Nuts and seeds are not completely free of carbohydrates, but are among the groups of food that contain the least carbohydrates. For example, 1 oz. of raw or roasted almonds contains 6 g of carbohydrates, 1 oz. of walnuts or macadamia nuts provides 4 g of carbohydrates, and 1 oz. of sunflower seeds has 7 g of carbohydrates. Cashews contain slightly more carbohydrates, with around 9 g of carbohydrates per ounce. Nut butter generally contains less than 5 g of carbohydrates per 2-tbsp. serving. The carbohydrate content varies among nonstarchy vegetables, but is generally lower than 10 g of carbohydrates per serving. Leafy greens and salad vegetables have the least carbohydrates, with only 1 g of carbohydrates per cup. Mushrooms, cucumber, celery, chives, endives, radicchio and bok choy contain the smallest amounts of carbohydrates. With the exception of cottage and ricotta cheese, which contain up to 5 g of carbohydrates per 1/2-cup serving, cheeses contain very little carbohydrates. Whether you choose cheddar, Parmesan, goat cheese, mozzarella or Swiss cheese, 1 oz. contains less than 1 g of carbohydrates.